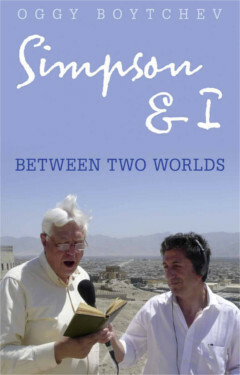 Simpson & I: Between Two Worlds documents some of the most memorable stories ever to appear on the Ten O’Clock News. In a career spanning thirty years, journalist and producer Oggy Boytchev has written a factual thriller about the highly competitive world of international journalism. With astonishing revelations of how stories are discovered and reported, he shares with us the often nail-biting, sometimes touch-and-go moments behind the camera – as well as the skill and courage it takes to break the news we all watch while safely tucked up at home. Brimming with colourful characters and locations, fascinating history and controversial politics, Simpson & I exposes Boytchev’s working relationship with one of the biggest names in broadcasting. John Simpson has often referred to their work as a ‘partnership’ – and, like most partnerships, theirs was fraught with tension. Painting a ‘warts and all’ portrait of both the man and their working relationship, Boytchev provides unique insights into the competitive and cut-throat world of international newsgathering, and the BBC. Threaded through the tapestry of reporting on international conflicts and towering world events are private observations – which are invariably thought-provoking, astute and arresting. Whether writing about the intimate world of odious dictators and their murderous political regimes, or family, friends and colleagues, there is a restless curiosity and uncompromising perception informed by the author’s unique background of being, in his words, ‘between two worlds’. Oggy Boytchev made a dramatic escape from behind the Iron Curtain in Bulgaria in January 1986. A few months later he joined the BBC World Service in London as a newsreader for the Bulgarian Section, before moving into mainstream journalism. In a BBC career spanning a quarter of a century he has covered the majority of international conflicts since the late eighties. Latterly, he became John Simpson’s producer and accompanied him on dangerous undercover assignments around the world. He has produced television news reports and documentaries from more than forty countries and the world’s major war zones. He lives in North London.